On March 1 1967 Warley Model Railway Club was formed. Their first exhibition of club member’s handiwork was at the Bridgnorth Model Railway Club Exhibition in May 1967. Soon after a decision was taken to hold the club’s first exhibition on October 21 & 22 1967. 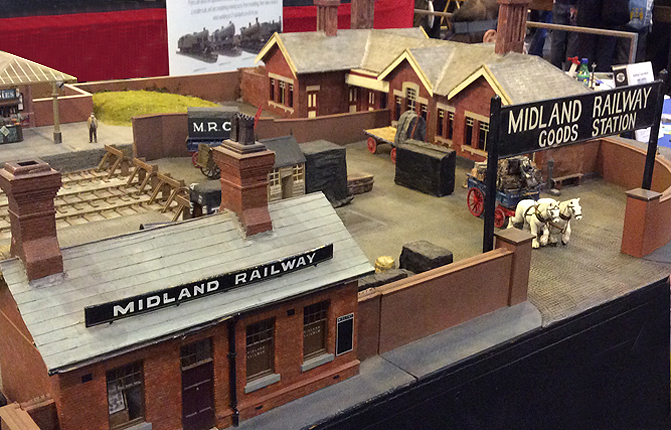 There were three working layouts presented by Warley, Stourbridge and Lucas clubs. In April 1968, the club moved into premises at The Harry Mitchell Centre, Smethwick. This remained the club home until three wooden huts on the same site became available. The move allowed the club to expand its modelling activities. In 1971 the Circle became Warley Model Railway Club reflected the popular title in 1982, by a change of name to `Warley Model Railway Exhibition’. By 1991, all available space within the Harry Mitchell Centre was being utilised and there was no further room for expansion. In April 1992, Paul Jones, who had held the post of Exhibition Manager for a number of years, presented a proposal, which was accepted by the Club to pursue the viability of hiring a hall at the National Exhibition Centre for the annual exhibition. For legal reasons the Club formed a company to organise the event, Warley MRC Exhibitions Limited, the company is wholly owned and directed by the Club, but mandated to organise and run the annual exhibition on behalf of the club. About this time the club also moved clubrooms, by renting an old post office sorting office in Albert Street, Oldbury, where there was more space available for modelling activities and proper storage of unused layouts and all the paraphernalia of the exhibition in one building. In October 1993, Warley Model Railway Exhibition, now titled Warley National Model Railway Exhibition to reflect its new site and target audience, opened in Hall 11 at the National Exhibition Centre. The show was successful enough to encourage the club to make the NEC its permanent exhibition site and within two years, expand into a larger hall. There have been changes of hall from year to year, and the exhibition has continued to grow. 2007 was the 40th Anniversary exhibition and the largest the club had ever held up until that date. On 11th June 2005 Warley MRC moved to its current home. The club purchased a factory unit about two miles from its then home in Oldbury. The premises has sufficient space for a large meeting room, library, offices and an area where at least one layout of each of the groups can be erected at the same time.